My Vegan-Until-8-PM "diet" was going so strong that I actually went straight through for 48 hours as a vegan. All that abstinence had me craving meat and cheese so it was time to launch into a mildly carnivorous dinner plan. For a salad I made a dressing with fig preserves, tahini, Dijon mustard, balsamic, and a little sesame oil. 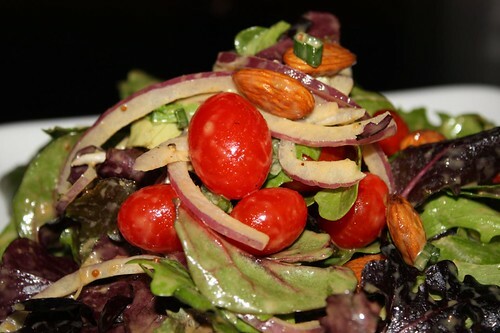 I tossed it with mixed greens, sliced red onion, grape tomatoes, and almonds. I had intended to purchase some fig-infused balsamic vinegar for this dressing but the $12.99 price tag scared me off. I'm sure it would have been great but my bank account enjoyed the plain old balsamic just fine. I had purchased some ingredients to make an oddball hors d'oeuvre for a gathering last weekend. It never ended up coming together so I wound up turning it into Hawaiian pizza. I used thick slices of Black Forest Ham, mozzarella, fontina, sliced red onion, sliced tomato, pineapple, sliced green onion, and grated Parmiggiano to make the pizza. Jen commented on having only experienced this dish as a child in Canada and that after moving to America this never seemed to be a pizza option available to her. I had definitely had my fair share of Hawaiian pizza growing up in Rhode Island. It turns out that Hawaiian pizza seems to have been invented in a pizzeria in Chatham, Ontario, a mere 180 miles away from where Jen grew up. That is if Wikipedia is to be trusted. I can't find any secondary source to back that up. But that's okay. It's the internet! Things don't have to be properly researched or correctly reported. That, my friends, is the future of hard-nosed journalism (which, of course, I completely think this blog is). The 10's are going to be great! Jen is mistaken. 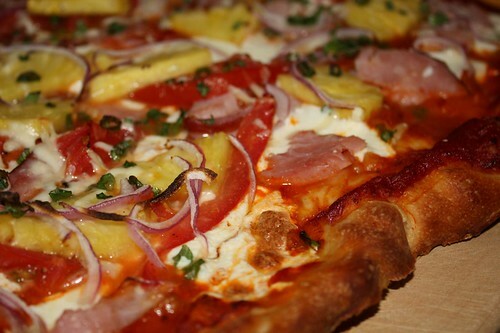 Hawaiian pizza is wildly popular in the Chicago area. When I worked at Lou Malnatis, I got at LEAST two calls a night of people trying to order pineapple/ham on their pizza and when I told them we didn't serve that, it was like I told them they were going to die tomorrow. Always met with deep shock and disbelief. So many conversations went "WHAT? YOU DON'T HAVE THOSE TOPPINGS AT ALL?!?!!REALLY? There's no pineapple somewhere in the kitchen you could just throw on there for me?!!" Sir, we are a pizza/Italian restaurant. There are no spare pineapples just laying around back here in the kitchen. Jen definitely directly contradicted this during our discussion. She claims that sausage pizza replaced this. Yeah, but Mouse: how many orders of sausage pizza did you get a night? The fact that you didn't serve it rests my case! C'mon, you should have just had pineapples lying around! Also, your comment seems to undermine your main premise that it was popular. I think it's a weird regional thing. Like how you can't get a steak and cheese in New York City but you can get them ANYWHERE in Rhode Island or Philly.